Smoothies have become the poster child for healthy living over the past few years. Especially green ones. Walk into a cafe and you’ll no doubt find them on the menu. They have also become a staple breakfast item for people who need to blend something up before heading out the door. However, smoothies can be deceiving. Although they might look and sound healthy, the sheer amount of fruit added to some of them results in sky high sugar levels. It’s natural sugar, yes. But if you do your research, any form of sugar in large quantities is not ideal. My solution is to blend up my own smoothies, using a few recipe hacks to lower the sugar content. It’s still great to include some fruit for sweetness and the health benefits provided by whole fruits. I just keep the fruit content to one serve, or two, max. Frozen zucchini: I know it sounds weird. But replacing some of the fruit in your smoothie with a small handful of chopped and frozen zucchini helps to maintain the smoothie’s thickness while reducing sugar. It works in a similar way to frozen banana to thicken things up. You won’t taste it either. It’s best to chop up the zucchini before freezing it to make it easier for your blender. Raw nuts: Raw nuts, particularly cashew nuts and macadamia nuts, add a natural sweetness to smoothies. They also provide a lovely creaminess and a hit of healthy fats to keep you feeling satisfied. 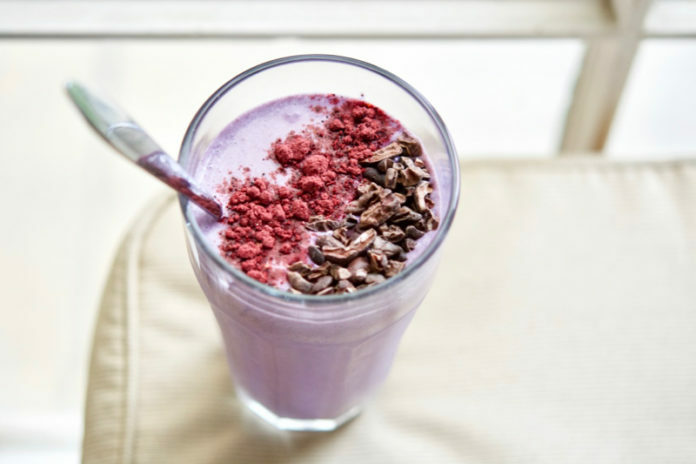 I make this Creamy Berry Smoothie often, using cashew nuts or macadamia nuts. The recipe also includes coconut flakes, which provide extra sweetness. Baby spinach: When adding greenery to smoothies, if you want to keep things on the sweeter side it’s best to avoid strong tasting greens like kale. I find that baby spinach leaves are much less overpowering, which still providing plenty of vitamins and minerals. Naturally sweetened protein powders: A naturally sweetened protein powder is a handy way to add some flavour to your smoothie without boosting the sugar content. It also makes the smoothie more filling. I personally go for protein powders sweetened with stevia. When buying whey protein powder, I previously wrote about the difference between WPI and WPC if you’re wondering which to choose. As always, remember to read the ingredients list to make sure the powder doesn’t contain any strange fillers or artificial sweeteners. Berries: Berries are naturally lower in sugar than other fruits and provide a host of antioxidants. I like to add a handful of mixed, frozen berries to my smoothies as one serve of fruit.